As the world eagerly awaits for the biggest and much talked about movie debut of Transformers on June 28, millions of Transformers fanatics from practically all walks of life can only be fortunate to have their favorite league of transfiguring robots loaded with exciting and explosive line-up of events, fun-filled activities, trailblazing merchandises and other great surprises to celebrate the comeback and the undying legacy that is Transformers. In the recently concluded MTV Movie Awards, the world's largest television network had given Transformers a stump of approval after being chosen as the Best Summer Movie You Haven't Seen for 2007, placing Pirates of the Caribbean and Bourne Automatic behind the pack. The Transformers live action movie brings the battle of the two warring robots of Cybertron, the Autobots and the Decepticons to Earth leaving the future of humankind hanging in balance. Transformers originally featured the heroic Autobots headed by Optimus Prime and their main opponents, the Decepticons with Megatron as the leader. Transformers are best known as an intelligent machines that are able to transform and reconfigure itself into innocuous form such as car, aircraft or animal. There have been a number of popular spin-offs based on the original Hasbro toy line including the widely read Transformers Marvel Comics series and animated TV programs that began airing in 1984. 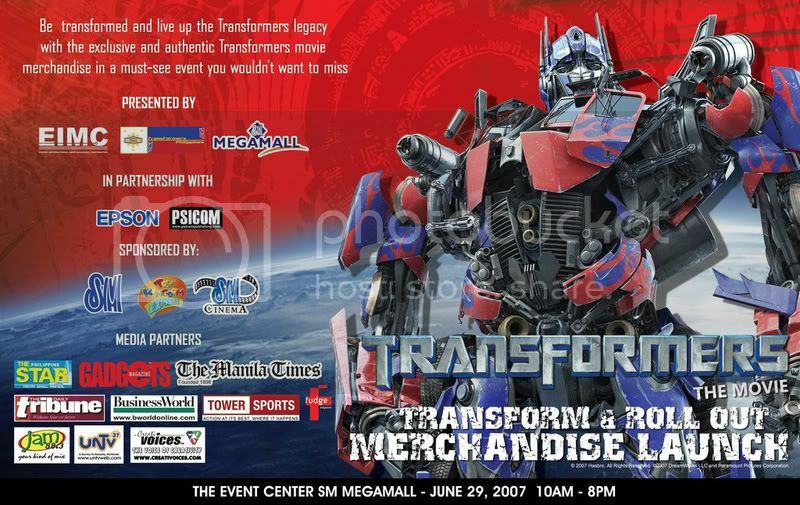 Consequently, the equally awaited market release of Transformers licensed products will be officially launched on June 29th at Event Center of SM Megamall Bldg. A. The whole day event aptly dubbed as The Transformers : Transform and Roll Out! the Movie Merchandise Launch will feature an art exhibit, drawing & trivia contest, video game demo, panel discussion for hobbyist and Transformers collectors, stage performances, movie promotion and a whole lot more! The Transformers thrilling live action movie is directed by Michael Bay with Steven Spielberg as executive producer. 2. Draw your best action scene or pose of any Transformers characters or scene from any series and generation or movie. 5. You have one hour to finish the drawing. Participants will be on stage competing for the fastest to transform the Transformers toy from vehicle mode to robot mode. The fastest transformers speedster will win ! Hourly trivia contest for all event visitors. Answer the trivia correctly on stage and you will win a prize. Or in its stylish repaint, or vintage style. To participants, pls. Include a calling card size label with your Name, Entry name, Description, website or group name. Come up on stage as your favorite Transformers leader by voice acting them. The best quote line or dialogue from any series or movie will win. The best and colorful entry will win. Contest will start at 10am-7pm at the activity area. Be a rockstar for a day, rocking the tunes from the Transformers movie soundtrack. By playing it in air guitar style ! Contest will start at 7pm.